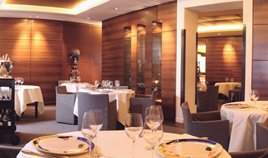 Dark African wood and rich leather compose the decoration of the Guy Savoy Restaurant in Paris. Guy Savoy Restaurant counts among the 10 best tables of Paris. A unique Chef for a unique Cuisine. The artichoke soup with black truffles, sea bass with spices, and veal kidneys in mustard-spiked ... and much more. The atmosphere of the restaurant is joyful as Savoy explain that "having fun is just as important as eating well". A unique experience.